Crowbar to be Touring with Killswitch Engage in November/December and Corrosion Of Conformity in 2019! 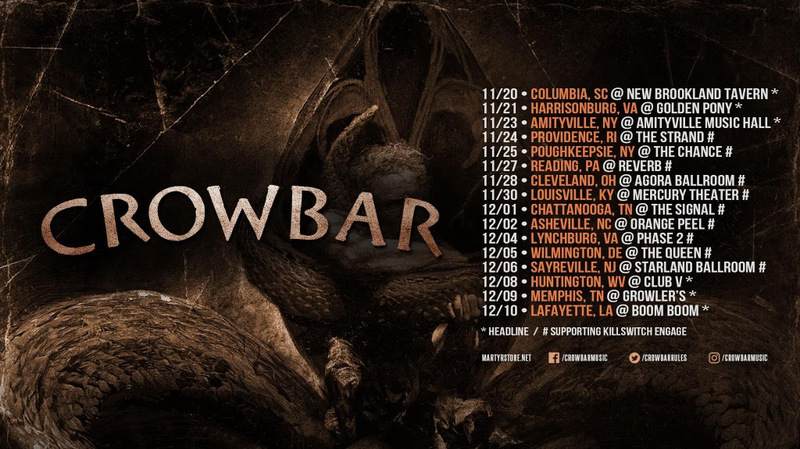 Crowbar will be providing support for Killswitch Engage beginning November 20th in Columbia, South Carolina. The tour is primarily on the east coast of the United States with the tour wrapping up on December 10th in Lafayette, Louisiana. Check out the tour dates below! Crowbar will also be touring in 2019 providing support for Corrosion Of Conformity. Joining the aforementioned bands on the bill include Weedeater, The Obsessed, and Mothership. The tour will begin January 19th in San Antonio, Texas and wrap up on February 27th in Nashville, Tennessee. Check out tour dates below. Silverstein Tour with Hawthorne Heights, As Cities Burn, and Capstan Starts Tonight!